Indiana has a strong restaurant and foodservice industry that is expected to bring in $11.2 billion in revenue in 2016. There are 321,700 jobs in restaurants and food service in the state with another 32,600 expected by 2026. A formal education in the culinary arts can make a job applicant stand out and get noticed, landing a great job in an exciting field. We put together a list of the top 10 best culinary schools in Indiana. 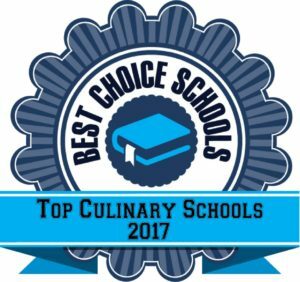 Schools featured in our list offer professional development opportunities, hands on instruction, modern culinary facilities, and have a positive reputation in the industry. Many of the programs on our list are accredited by the American Culinary Federation, an indication of a quality culinary program. The Art Institute of Indianapolis is a top culinary school offering an extensive array of culinary degree and certificate programs. Students gain hands on experience both in the culinary classroom/laboratory and by working in the student run restaurant, Eleven at the Pyramids. The restaurant is open for lunch and features entrees from around the world. Students are engaged with the community through special events and fundraisers, allowing them to further develop their professional skills. The Chef’s Academy at Harrison College offers both an AAS Degree in Culinary Arts and an AAS in Pastry Arts. The Culinary Arts degree program features 10 week terms and courses that cover food service purchasing, nutrition, meat and poultry cooking, and classical cuisine. Hands on experience is a key component of this program, allowing students to practice and perfect their skills and techniques. The Pastry Arts program gives students hands on experience in decorating and making classical pastries. Students experience a commercial kitchen and bake shop and graduates are prepared for entry level positions in the baking and pastry industry. Vincennes University is a top culinary school featuring both degree and certificate programs in the culinary arts. Students work in a kitchen lab during each semester of the program and complete their degree by participating in a full service dining experience where they prepare and serve a meal to guests. Graduates have found employment in all levels of the career ladder by companies such as the Hyatt Regency and the Sands Casino in Atlantic City. Ivy Tech Community College is a top accredited culinary school offering certification and degree options in Culinary Arts, Baking and Pastry, and Hospitality Management. Concentrations are available in Restaurant Management, Hotel Management, Event Management, and Beverage Management. The program is accredited by the American Culinary Federation and the Culinary Arts concentration has earned exemplary status. Culinary labs are designed to mirror real world commercial kitchens so students get familiar with equipment they will use out in the workforce. Students gain work experience by serving lunch on Wednesdays at the Yellowwood Restaurant, located on campus. The program is affordable, costing as little as 1/4 of what other schools in the region would charge for a similar education. Ivy Tech Community College in Indianapolis offers an AAS in Hospitality Administration with several different concentration options including Basking and Pastry Arts, Beverage Management, Culinary Arts, Event Management, Hotel Management, and Restaurant Management. Students who graduate in the Indianapolis area have excellent employment opportunities through the vast array of restaurants and the Indianapolis Convention Center located in town. Culinary Arts Specialty students who want to continue their education by earning a BS Degree in Hospitality Management will benefit from an articulation agreement with Ball State University.